HOLLAND, Mich. (Jan. 31, 2017) — Elzinga & Volkers (E&V), a leading provider of construction management services, will be providing support to construction-related workforce development organizations this year through their third annual “Checks for Charity” program. The construction industry has been facing a skilled labor shortage in West Michigan and beyond. E&V is working tirelessly to inspire growth and motivate change so this is no longer an issue. Through this year’s “Checks for Charity” program, E&V is hoping to add extra excitement to Super Bowl game day for several agencies that support workforce development. 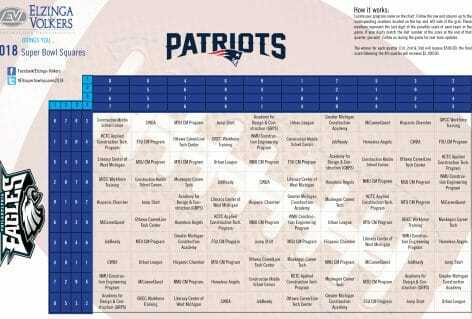 To determine which organizations will receive donations through the “Checks for Charity” program, E&V is hosting a Super Bowl Squares contest, whereby the organization listed in the square featuring the score at the end of each quarter will receive a monetary donation. Each of the 20 workforce development organizations and programs included in the competition have been given five random spaces on the game board. There will be four prizes totaling $2,500. First, second and third quarter winners will be awarded $500 apiece. The final score winner will be awarded $1,000. Follow E&V’s LinkedIn, Facebook and Twitter pages for real-time updates on winners and scores during Super Bowl Sunday, February 4. Join the conversation using #EVsuperbowlsquares2018.